The Rathaus or City Hall is a primary attraction in most Austrian towns and villages - Vienna is no exception. The large and impressive "Wiener Rathaus" occupies a grade A site by the Ringstraße, between the Houses of Parliament and the University. It faces the Burgtheater, the National Theatre of Austria. 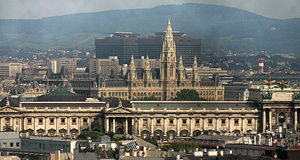 The Rathaus is the place where the city′s council meets and also the mayor of Vienna. Since the capital has the rank of a federal province, the council also serves as a provincial parliament and the mayor as a governor. The building itself is a rather peculiar mix of historicist styles and impressions: It was designed by Friedrich von Schmidt between 1872 and 1883. Its architecture embraces elements from neo-Gothic styles, but also from Baroque and other periods. The central tower is the most impressive part of the building, 105 meters high and inspired by the town halls of Flemish and northern German cities. The base of the building has seven large courtyards and several halls. This includes the "Festsaal" ("ceremonial hall"), which is the biggest hall by the Ringstraße and thus a popular site for the organization of large balls and receptions. A total of 800 events take place in the Festsaal every year, including the famous "Life Ball", a charity event for AIDS research and care that is very popular with the gay scene of Vienna and almost as famous as the Wiener Opernball. The total size of the Rathaus area is 130,000 square meters, but the building itself covers only some 20,000 square meters - the rest is occupied by a square and a park, the "Rathauspark". The Rathaus - to add a few more useless facts - is 152 meters long, 127 meters wide, has 1,575 rooms and more than 2,000 windows (feel free to ask "So what?" now). Standing in front of the building, you might see the 3.5 meter high statue of the "Wiener Rathausmann". The Rathausmann is kind of a knight in Renaissance style armour. According to rumour, the armour was inspired by the kit worn by the legendary Emperor Maximilian I, who was also called "the last knight". His armour can be seen in the Hofjagd- and Rüstkammer in the nearby Hofburg.The site that is occupied by Rathaus and Rathauspark is a very central location and it was subject to a long struggle and negotiations between the city of Vienna and the Emperor. It became something like an icon or symbol for the centuries old conflict between Vienna and the Crown, which later transformed into a conflict between Vienna and the provinces. Only in 1870 Emperor Franz Josef I granted the permission to build the Rathaus. The park between the building and the Burgtheater was designed by Hermann Rudolph Siebeck, who was also responsible for the eight statues in the central road leading to the main entrance. Before they got to the park, these statues were placed on a bridge on today′s Karlsplatz in front of the Karlskirche Church. Once the Wien River was covered, there was no need for a bridge anymore. The statues depict important figures from Austrian history. One of the statues is the writer Joseph von Sonnenfels, who was Jewish. That didn′t go very well with the Nazis, who replaced him with the composer Christoph Willibald Gluck. Today, Gluck lives on the Karlsplatz and Sonnenfels has returned to the Rathausplatz. Other statues are various military leaders, artists and monarchs of Austria. In winter, the Rathauspark is transformed into an X-large ice rink and people skate around between the trees. The whole experience is spiced up by Strauss music (it′s Vienna, after all), colourful lights and the nearby Christmas Market on the Rathausplatz.